An Intel board from the former AMD purists. Seemingly from out of nowhere, here comes AMD heartthrob, Sapphire, with a top-end Intel motherboard, the Pure Black X58. Now, it's no stranger to motherboard manufacturing but due to its AMD leanings in the past, as its largest graphics board partner, the expectation was that Sapphire would remain loyal to the AMD mainboard market. That's not to say Sapphire is necessarily being disloyal with this release however, the X58 represents a chipset far beyond anything that AMD is able to produce at the moment. As the only triple-channel desktop chipset around, and with a general price-tag to match the sky-high performance, it's quite apart from the top end of AMD's offerings. And as the components market gets tougher more and more companies are having to diversify in order to compete, or sometimes just to stay afloat. There has been speculation at every trade show this millennium as to whether Sapphire was going to go all GPU agnostic and start creating Nvidia graphics cards. That would've likely been a disastrous move though, destroying the good work it has done with ATI and AMD in the past. 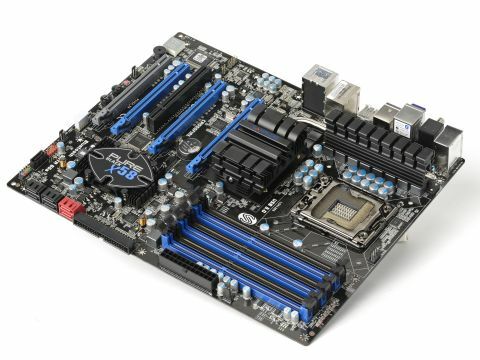 Producing Intel motherboards though is less likely to hurt that relationship and supporting the majority system platform can only be good sense. After all, Sapphire did not produce a huge amount of AMD's motherboards in the first place. But given its limited motherboard history can Sapphire create an Intel motherboard to match its rather lofty price tag?